A few months ago the nice folks at Fishermen’s News asked if we would write an article about the upcoming changes in refrigerant regulations. There is some confusion among fishermen about which refrigerants are okay to use, how soon others will be phased out, and which ones are banned outright, as well as whether they should retrofit or replace their current equipment to be in compliance with the ever-changing regulations. So we wrote an article on this topic, which is now available in the June issue. If you are not a subscriber you can pick up a hard copy here. Some of the features, including this article, can also be found on their web site. You can read the article in its entirety here. 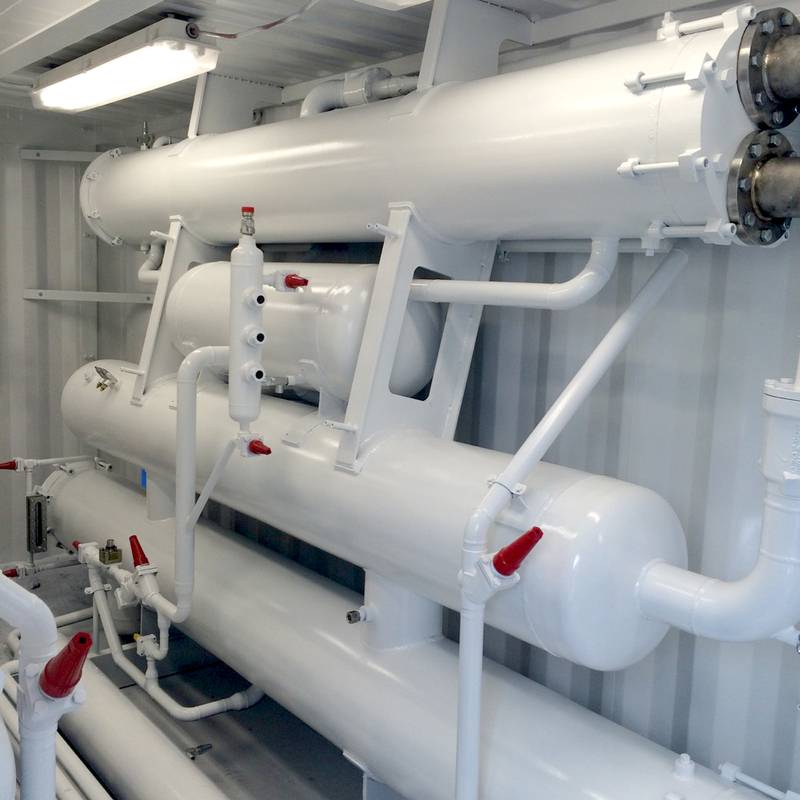 In March we started an interesting project for Captain Keith Colburn of the F/V Wizard: two 85 ton RSW systems in a cargo container. 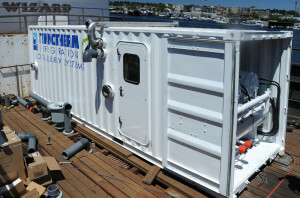 This portable system can be hoisted onto the deck to provide chilled water during the summer tendering season and then removed for crabbing in the fall. These two very different duties put a unique stress on the ship’s refrigeration system. While tendering, the Wizard needs an efficient refrigerated seawater (RSW) system, but when crabbing she needs little more than a clear deck for all the crab pots, as the holds are filled with non-refrigerated water. This unit uses Bitzer open-drive screw compressors and 100 hp motors. It also has proprietary TeknoLogic automation and controls for ease of use. 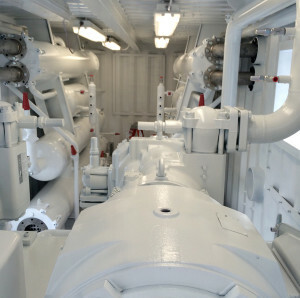 As long as the boat has an internet connection, engineers and technicians can see exactly what is going on with every part of the system and diagnose problems from anywhere in the world. A view down the length of the container. In the foreground is the motor, then compressor and refrigerant line. Behind are the twin 85 ton RSW systems at either side, and at the rear is where the electrical panel will be. A chiller, condenser, and high pressure receiver are secured to each side of the container. 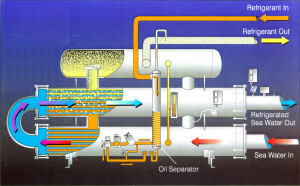 Oil separators plus compressors and motors are at one end while controls are at the other. All the equipment is fully piped, meaning all connections are made to the flanged connectors on the exterior. 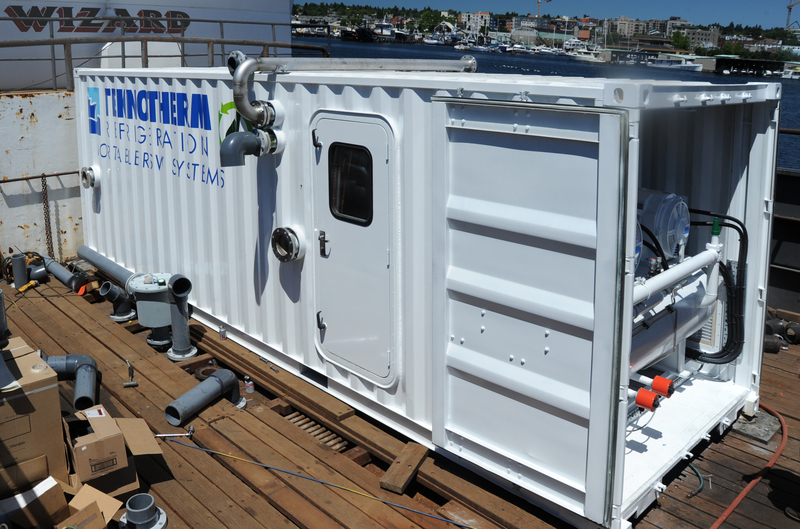 This unit will be loaded onto the F/V Wizard later this week. We will finish installing the controls, make final adjustments, and do full testing before the ship leaves port. An in-depth article with more photos will appear in the August issue of Fishermen’s News, so be sure to check it out if you want more information on this fascinating project.